This is a photo of Chalk Farm station looking towards Euston; it is thought to be rather rare in that most photos of Chalk Farm are at platform level. Is anyone able to provide a date and any other details please? Is this just at the start of the demolition of the station? The LNWR Gazette for March 1914 has a photo captioned "just before demolition". Presumably the demolition was in connection with the electrified New Lines. Camden Yard is in the distance behind the long line of wagons by the signal box. The aforementioned line with the wagons on is now the slow line and is now low level at this point. Camden shed is on the right of the picture. Robert states that the slow lines ended up where the wagons are on the right, this is in Camden Yard and remained as such until the mid 1980's when the last roads in the yard were lifted, The running lines in the centre were and still are the slow lines albeit at a lower level as a result of the dive under constructed west of Regents Park Road bridge, the up fast is on the left of the left hand island platform. 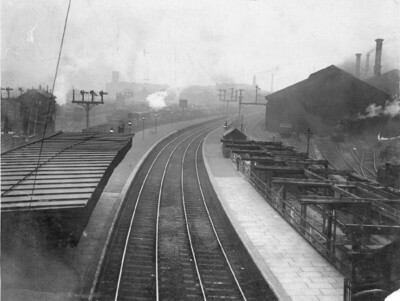 The down fast is visible above the left hand platform and the Down Siding adjacent to the shed wall also the various main line signals were still present until the 1945 colour light re-signalling with Crewe power operation from Camden No.1 & 2. The signal box on the left is Camden No.2 and remained until the 1970's as Camden Yard shunt frame. According to the Signalling Record Society's "British Railways Layout Plans of the 1950s" volume 1, Euston to Crewe, the Camden No 2 signalbox was out of this picture, behind the photographer and to the west, nearer to Primrose Hill tunnel. The box visible on the left in the photo was Camden No 5 around 1900, and was presumably still so numbered when the photo was taken. The subject of track layouts and signalboxes in the Camden area is a complex one! I have looked at OS maps, photographs, LNWR minutes, Appendices and WTTs as well as Board of Trade inspection files, and I still do not fully understand what changed when! The Swift book quoted by Harry shows the layout and signalling as in the 1950s. It was very different at the time of the photograph (1914). I believe that after the Euston to Camden widening of 1905/6 there were Fast and Slow lines on Camden bank. I have not conclusively resolved when the burrowing junctions were brought into use, but it was probably after 1914. They were only completed in their final form after the opening of the New (later DC) Line between Camden and Queens Park in 1922. A new Camden No.1 cabin with a �Crewe� electric frame was brought into service as part of the 1905/6 work, at the Euston end out of sight round the curve in the photo, but it think it was again replaced by the overhead cabin again with an electric frame, some time in the 1915-20 period. Before the burrowing junctions were constructed Nos. 2 & 4 cabins were opposite each other between the station and the tunnel, but they were later replaced by a new No.2. No.6 cabin was at the Camden Road end of the NL platforms which had 3 faces at that time. I think the cabin in the goods yard throat was always No.5, although it may have been replaced by a new structure at some time. Don�t ask about No.3! I may have some more info at home � I am at work at present and typing this from memory. At last I've found some time to check my notes and records on Camden. The lines and junctions in the area were remodelled when Euston to Camden was widened in 1905, with Fast and Slow lines up the bank and new Up Engine and Down Empty Carriage lines through the new Park Street tunnel at the lower level on the west side. New SBs were constructed at Camden No.1 south of the station, and Camden No.2 north of Regents Park Road overbridge, each with a "Crewe pattern" all-electric frame. No.2 replaced the old No.4 SB. The old No.2 near Primrose Hill tunnels was renamed No.3 and given a new mechanical lever frame. The New Line (later DC Line) was constructed under the LNWR Act 1907, but the original idea was for a terminal loop under Euston station, as mentioned in (for example) MC Reed's book. This was modified in the LNWR Act 1912 to form the junctions at Camden with the Slow and NL Local lines that we know today. This Act included powers to purchase much additional land on the Up side between the station and the tunnel, approximately doubling the width of the formation at this point. Some work probably commenced before the Great War, but I haven't yet looked at the PW, Works & Estate Comm minutes for this period. Chalk Farm main line station was closed on 10 May 1915 according to all the sources that I have, the same day as the Bakerloo service to Queens Park was extended through Kensal Green to join the New Line at Willesden New Station. I find this hard to reconcile with Dave P's statement (above) about the photo in the March 1914 issue of the LNWR Gazette, unless the closure was deferred from 1914 to 1915. Track alterations commenced in July 1915 with the diversion of the Local lines onto a new alignment further north on the newly-acquired land. Work continued from then until 1917 with all lines moved across in stages to create space for excavation of the ramps down to the New Line tunnels. The new Engine line tunnel was brought into use in 1917 along with a temporary Euston No.5 SB. At some point between July 1916 and July 1917 the junctions between Fast and Slow lines were relocated further south on the site of where the station used to be. A new and larger Camden No.2 SB was brought into service around the same time, again with a "Crewe system" all-electric lever frame. All this was going on during the Great War, at a time when many infrastructure projects were postponed. Use of men and materials, especially steel and timber, required a permit from the Ministry of Munitions. This would not have been given unless it was thought that the work contributed to the war effort in some way, directly or indirectly. Camden No.2 SB was destroyed by fire in Jan 1920, and temporary signalling put in place. A replacement and larger No.2 SB was constructed a few months later, the opportunity being taken to incorporate the former No.3 SB (near the tunnel) into the area controlled by the new box. This survived until the Euston resignalling in 1965. Camden No.1 SB, an overhead structure on a gantry, was replaced by a LMS type 13 all-brick structure on an adjacent site in 1940, as part of the ARP strategy. This also survived until 1965.